Gallantmon X is an altered version of Gallantmon that carries the X-Antibody Factor : Gallantmon in its Digicore. 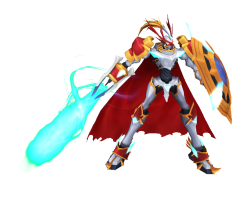 Gallantmon X is an Exalted Knight Digimon and a carrier of the X-Antibody. One of the "Royal Knights", it is a being containing contradictions, as it is called a guardian deity of the Net despite being a Virus attribute, and if by any chance its balance is lost, it is possible for it to become a dangerous being. It pilots the Flying Dragon machine "Grani", as a dragon knight that races across the skies. It is clad in holy armor refined and constructed from 99.9% pure Chrome Digizoid, and its right hand can become the holy lance "Gram" while its left hand can become the holy shield "Aegis". It honors chivalry, and is a loyal vassal towards its lord. Carrying out its devotion as a knight, this Gallantmon threw itself into the sacred battle and due to the X-Antibody it was at last blessed with the supreme sacred armor, sacred lance, and sacred shield. "Red Digizoid", "Blue Digizoid", and "Gold Digizoid" are rare metals, and its sacred hybridized equipment combined the Chrome Digizoid which boasted the highest known purities. Since its form was remodeled in order to demonstrate its holy power, the lance of light emitted from its sacred lance Gram was amplified. In addition, it is said that Gallantmon's red mantle from before acquiring the X-Antibody was given to the hero, Leomon. Zeig Saber Fire attribute 8 seconds cooldown 425 DS consumed 3 skill points per upgrade Learned at Lv. Royal Saber. Fire attribute 4 seconds cooldown 213 DS consumed 2 skill points per upgrade Learned at Lv. Final Elysian. Fire attribute 11 seconds cooldown 585 DS consumed 3 skill points per upgrade Learned at Lv. The third skill is an linear area of effect hitting every enemy vertical to the target. This page was last modified on 24 February 2019, at 20:57.